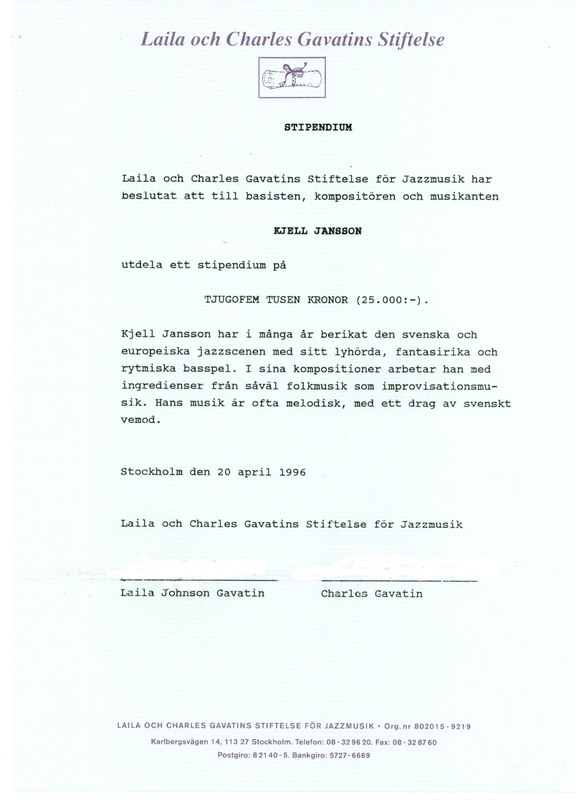 Basisten, kompositören och musikanten Kjell Jansson tilldelades 1996 ett stipendium från Laila och Charles Gavatins Stiftelse för Jazzmusik med motiveringen: "Kjell Jansson har i många år berikat den svenska och europeiska jazzscenen med sitt lyhörda, fantasirika och rytmiska basspel. I sina kompositioner arbetar han med ingredienser från såväl folkmusik och improvisationsmusik. Hans musik är ofta melodisk, med ett drag av svenskt vemod". For a couple of decades now Kjell Jansson has been providing jazz groups, above all those in Gothenburg, with swinging, driving, steady and, not least, imaginative bass playing. He has been the rhythmic and harmonic cornerstone in such groups as Mount Everest, Opposite Corner and the Åke Johansson Trio. Not least his solos using the bow have delighted such guests to Sweden as Chet Baker, James Moody and Toots Thielemans when playing together with Åke Johansson's Trio. Kjell was born in 1950 in Gothenburg. He grew up in a time when pop and rock was the music of youth. His father is an accordion player of the old stock, not a trained but a genuine musician. It became natural to Kjell to start playing the accordion when he was five years old. When he was nine he was given a guitar and a book with chords and soon he had a quartet playing music in the style of the English pop group "Shadows". At that time - in the '60s - all young people played the guitar so I changed into the electric bass. Later on he borrowed a double bass from a friend but it was not until 1969 that he bought a double-bass of his own. His father saw to it that he had lessons on playing with a bow. In 1967 he began playing in a rock and blues group. They played mostly in houses to be demolished but there were so many clubs and plenty of jobs that the group was very active in Gothenburg. Now and then he visited the jazz club Artdur and listened to, for example, Bill Evans, Keith Jarret and Booker Ervin. Artdur was his gateway to jazz. It was as a double-bass player that he first began to be known among the younger musicians in Gothenburg who were particularly interested in blues/rock-influenced music. Around 1970 he began to play modernistic fusion-jazz with Mount Everest, which at that time was a somewhat electrified group. With time the group became more acoustically inclined. In the process Kjell began increasingly to play upright bass, at the same time becoming firmly acquainted with the strong jazz traditions of the '50s and '60s, made up of the rich mixture of standards, blues and bebop. In autumn 1974 the Board of Nordic Music Cooperation elected Kjell and four musi-cians from the other Nordic countries to form a quintet to make an LP. In 1974-1975 Kjell was a member of the "Eje Thelin Quartet", a group that toured Denmark, Finland, Iceland, Germany, France and the US. When the group returned to Sweden Kjell was unable to move to Stockholm to continue playing with the group. He left just before they were asked to make the album that was later elected the "Golden Disc" in 1976. He formed his own group "Hot Six" which played the kind of music which today is called 'acid jazz', but that was twenty years before this conception was marketed under that name. In 1977 Kjell joined Åke Johansson trio. Åke was the first bebop musician with whom Kjell played with but Åke also played more free music with 'Opposite Corner'. Today, together with Åke, Kjell can play the way he likes without risking that Åke drops off his chair. They have much enjoyment when playing together and sometimes they accompany soloists and which has other aspects. Åke Johansson Trio has played many times with Chet Baker and James Moody but also with such musicians as Toots Thielemans, Art Farmer, Kenny Burrell, George Coleman and Doc Cheatham. Kjell Jansson the composer is less well known, but one can also hear ample evidence of his proficiency in this area, with his strongly melodic lines to which one can easily imagine words being sung. This has proved to be especially appropriate on the occasions when he has composed children's songs for concerts in schools. Many of his compositions are lyrical, some almost having the character of hymns. On the CD "Back from where we came" (TMcCD 009) all the tunes are composed by Kjell. Kjell is very well represented on records starting in 1972 with 'Waves from Albert Ayler' and continuing with 'Blue Waves' (1978), Opposite Corner's 'Low-High (1981) and 'Chet Baker Live in Sweden' with Åke Johansson Trio. Then the trio made 'Live At Nefertiti' (1983), 'Born to be blue' (1985) and 'Encore' (1987), a record that was awarded the "Golden Record". 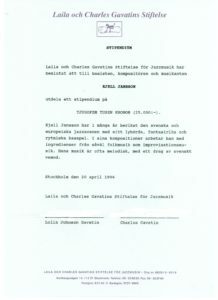 In 1996 Kjell Jansson received a scholarship from Laila and Charles Gavatin's Foundation for Jazz Music.